I finish off my review of the new Turtles trilogy style. Splinter is growing on me, as a hidden gem. He didn't look too cool in box, but now I am having fun with it. Also picked up a Metalhead, should I have to review that too? Aqua and Purple Battle SUV anyone? Anyone? 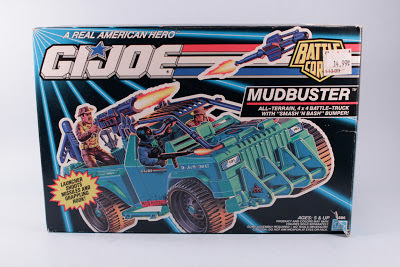 The Mudbuster has been on my short list for some time, as I have a couple long time corresponding toys to match to it. I had my choice over a mint in sealed box, mint in open box, and loose, at a toy reseller, and I picked the middle. 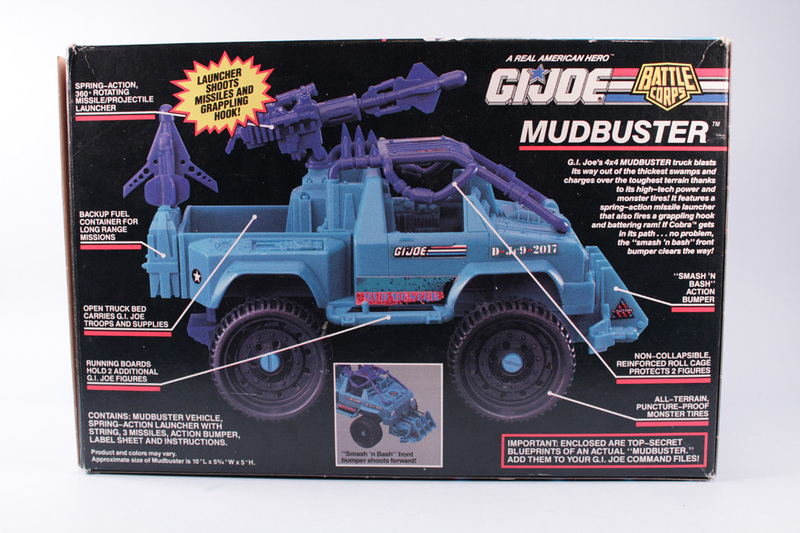 My first reason for kind of wanting the Mudbuster, was that since '93 or so, I had the Battle Corps Duke (v4). He has been stored away most of his life, but has been upgraded to the Duke shelf for most of the summer. I think there is a kicking Scarlet around here too, that would like a ride. The second reason for kind of wanting the Mudbuster, was the Mudbuster digital watch I have had since about, well '93. 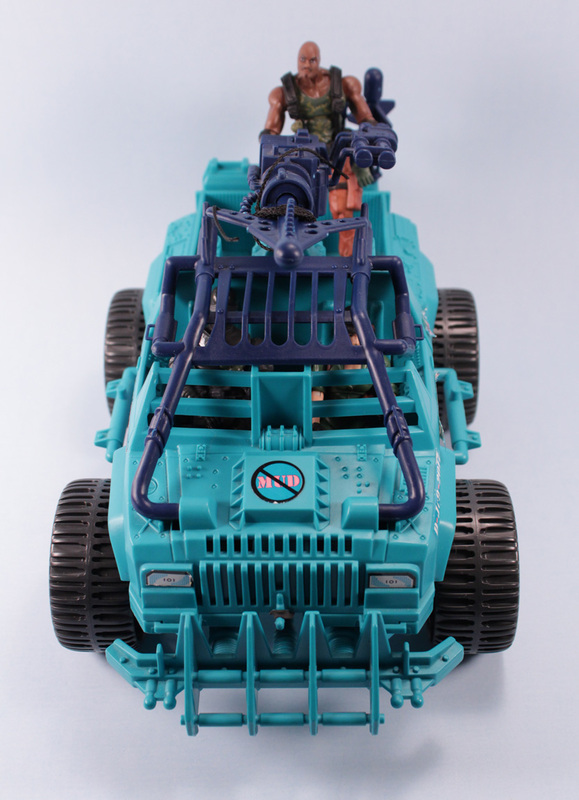 Every time I wore the watch, I though, I should look into getting the toy vehicle for the action figures. So now that I have a Mudbuster, it's not as exciting as I would have hoped. 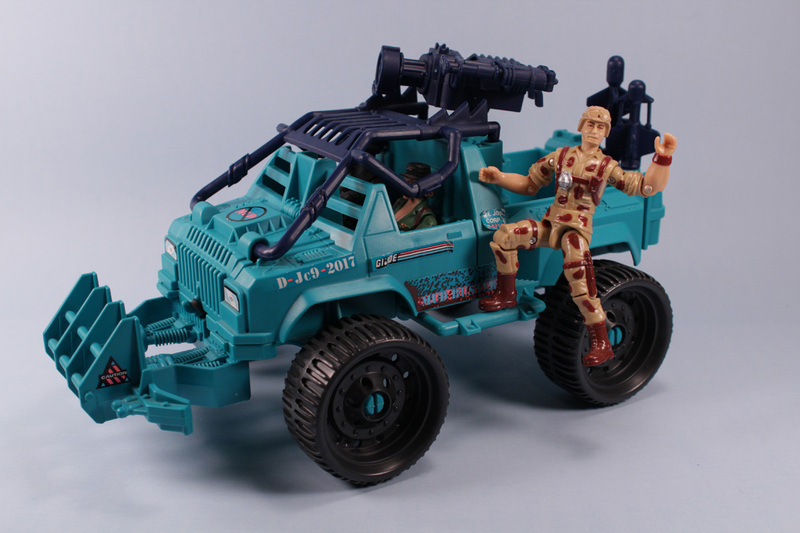 It feels a little more "basic" than the vehicles before, and the vehicles of now. Something feels off with its construction, a little light weight plastic or something. Maybe its a vehicle that is meant only for its time of '93. This was a crazy brutal sack form last night, I was so happy the NFL let the ToyMuseums Camera's in for the game. Jay Cutler spent a couple minutes down, but popped back up to play later in the game. GO BEARS! 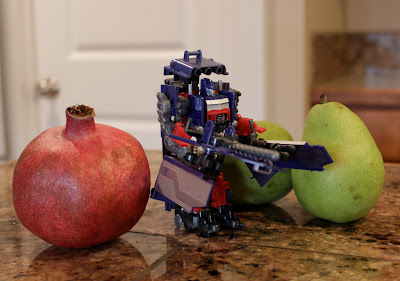 I took a trip to the discount store TJ Maxx today, and really din't find anything, but didn't want to go through all that trouble empty handed, SO I picked up this Optimus Prime toy at a good deal. 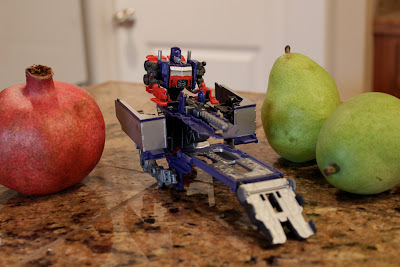 Its not very often that a trailer is included with Prime, so I thought it would be a fun play. There was a matching Megatron too, that I might just go back for. Optimus Prime's trailer transforms into two different modes, which makes for some extra fun. Above, a battle base mode is formed (there are a few ways to go about that too, I like the above concoction). 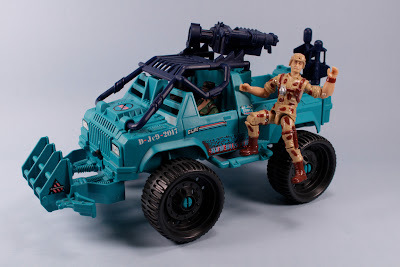 Below is a Assault Vehicle Mode, or a Mech style mode. 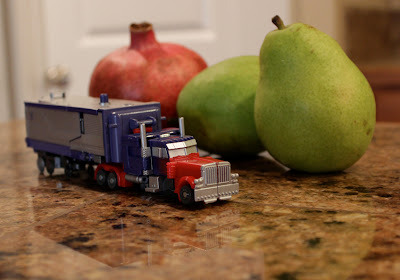 Its pretty much limited to Optimus being encased in his trailer, but looks kind of cool next to fruit. 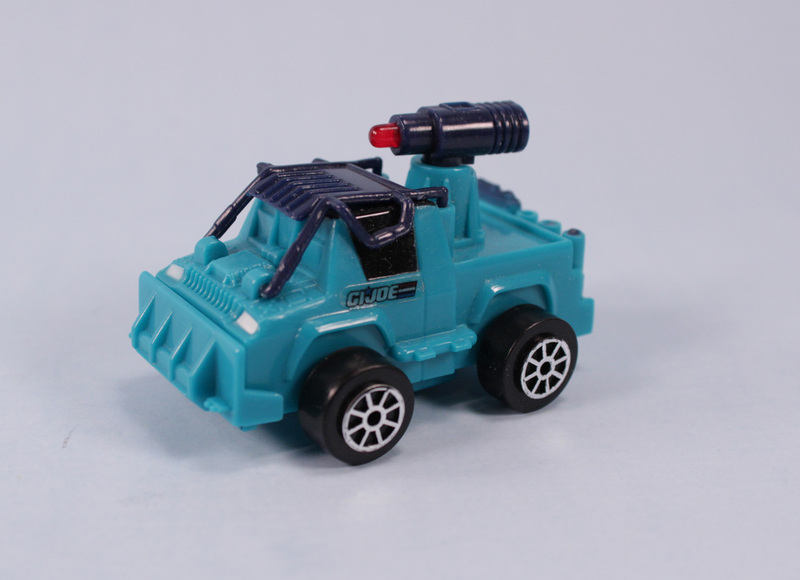 The form that I like the most is the vehicle mode, even though it was a pain to get it into. 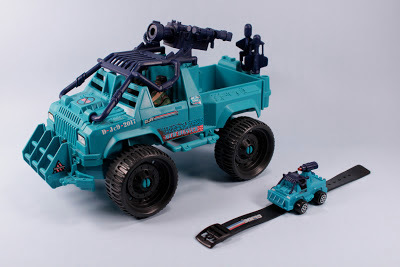 Its not really the best of truck and trailer modes, it just looks kind of cool. 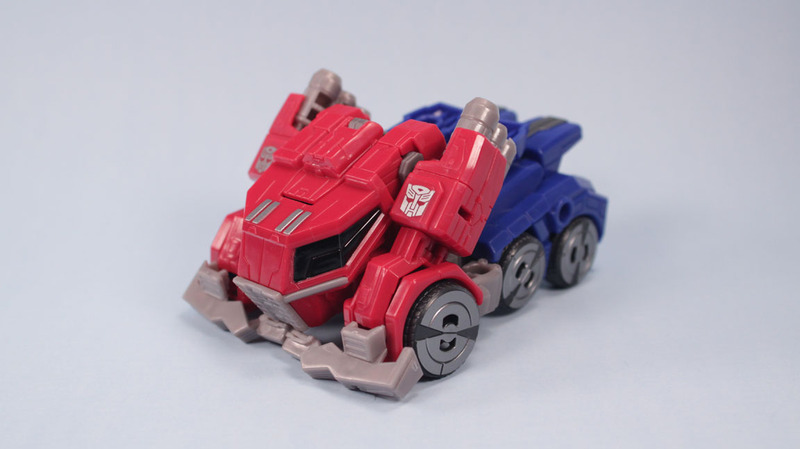 The back wheels are not moving, which is a bit disappointing. I will be keeping it in this form though, as its fun to drive into stuff. 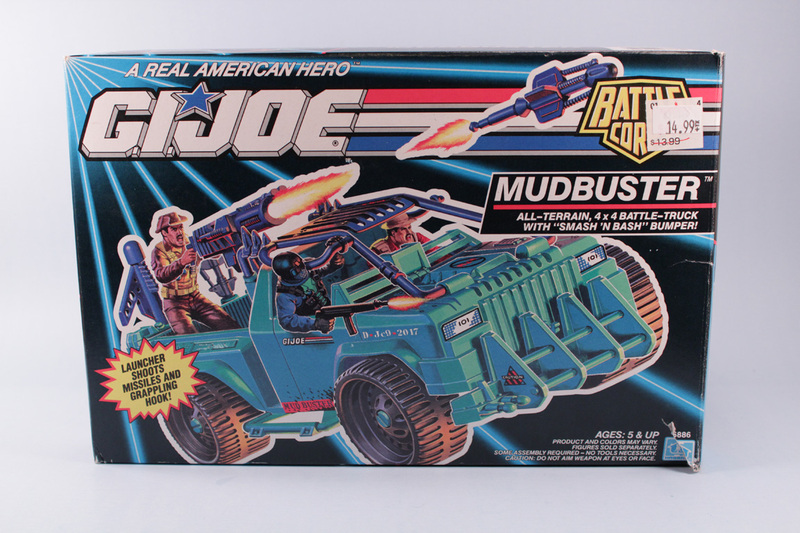 I would give the toy 2 out of five stars, but say what I will, that last shot is totally awesome. Thundercats Minimates Series 2 The Mutants are out and about checking on the grounds of castle Plun-Darr! 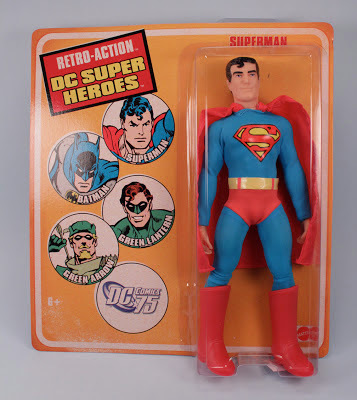 I am just now finally getting a chance to own a few Retro-Action DC Super Heroes. I REALLY wanted one when they first appeared on shelves a couple years ago, but I guess something else won out. The good guys also flew off shelves faster than the bad guys, which are still there. I have this vague Pre-School like memory where a "play-date" with another kid yielded a chance to play with possible originals. 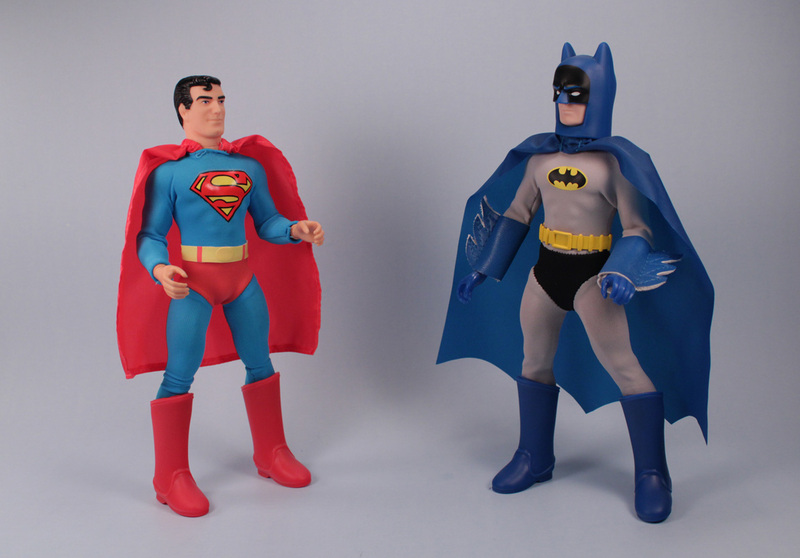 I am thinking at hardest capacity here, as I remember playing with a Spiderman, and I think Batman. I am sure if given a time machine, that wasn't even close, they were really obscure toys like Turnip Peat and Paper Cut-out Flat Stanly. 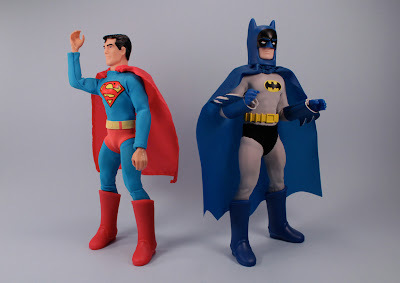 With the story aside, these two Retro Doll/Figures are have lots of nostalgia pack in, and they look awesome on the old mantle. They have joints, but those are really meant for play, as some spring back, others don't hold a stance. The clothing is very thin, but flexible. 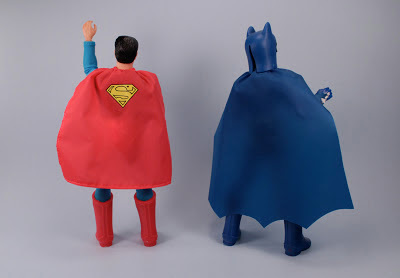 Capes are capey, with ability for fan flowing. Batman has a Bruce Wayne face under the mask. The colors really pop, and I can just imagine the whole collection would be fantastic. Oh what the heck, lets look at series 3 today. Now I have a really random assortment. 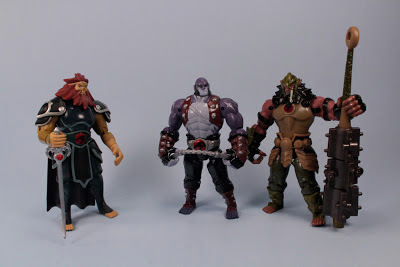 New Thundercats Grune the Warrior! Back in my day, we called him Grune the Destroyer! And he was huge! I picked up the new version of Grune the Warrior as I had only poor Mumm-Ra for the new Thundercats to versus against. Mostly off the shelves now, I picked him up at a reseller. Grune has some extra weapons, so he was a little more than the basic assortment. So do the larger added weapons make the difference? Sort of. 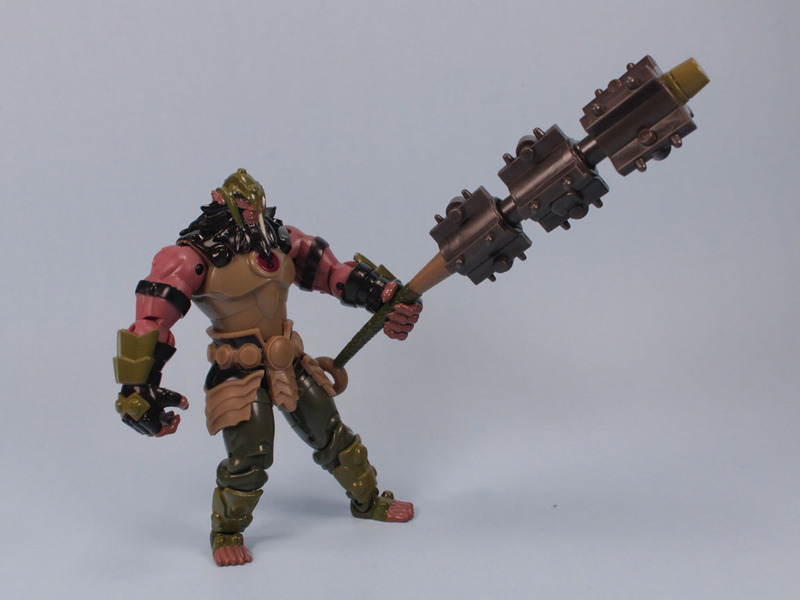 The monster mace here is really quite impressive for the size of figure. The mace does some spring extensions, that works fairly well. It also has a built inside magnet for attaching to Grune's back (took too much time to figure that out). 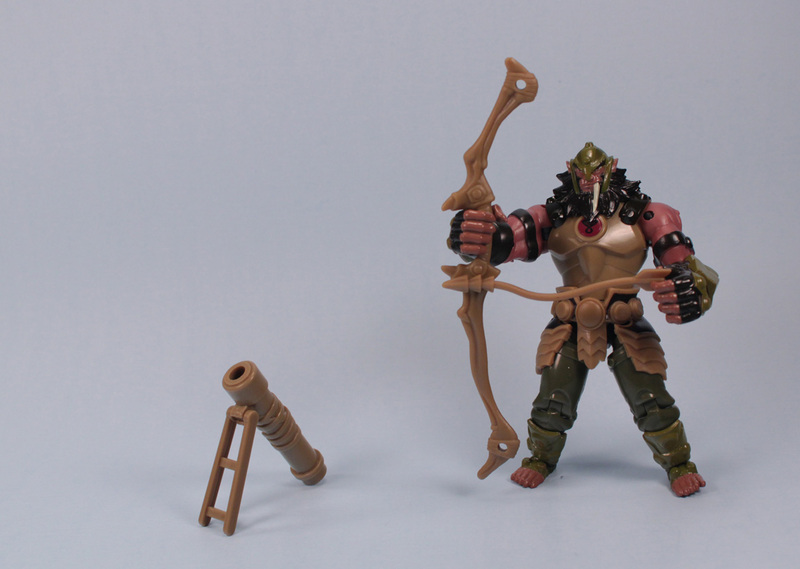 Grune also comes with a bow staff and bent arrow, thanks to the packaging. 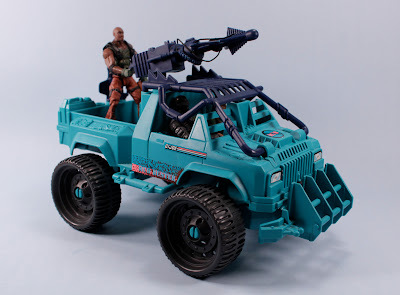 There is also a small tube launcher (darn, what is that called?) that doesn't shoot anything. Grune is invited to the thick guys club in newer Thundercats figures. He has some weight, but also stumpy legs, which I just now noticed Panthro has too. 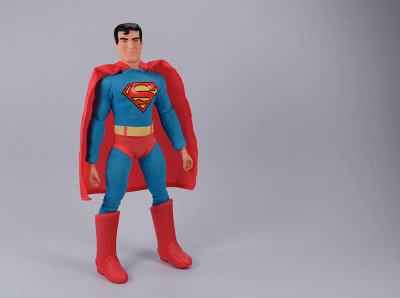 He is an okay figure, but not for the extra price. They kind of went on a stretch to call him deluxe in my book of Omens. Good to have though, as there was a big mistake on enough villains to good guys ratio in the whole collection. 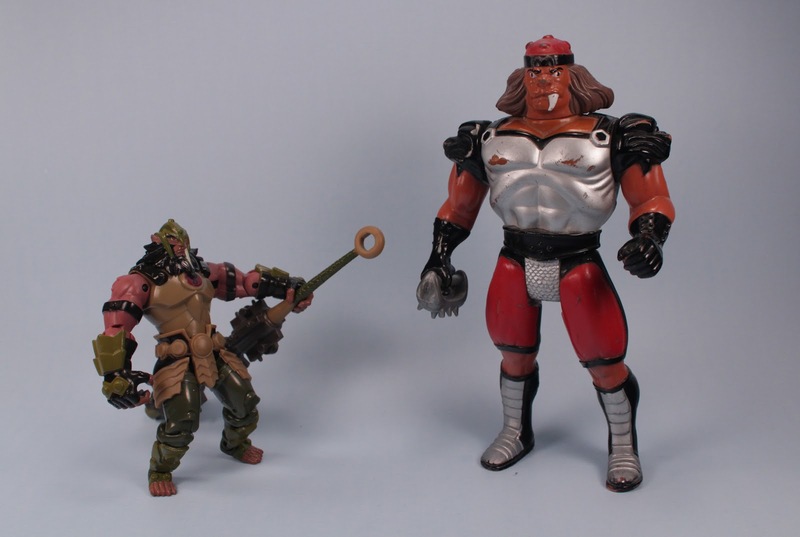 Thundercats Classic Minimates might just be the best Thundercats product to be released this past year. 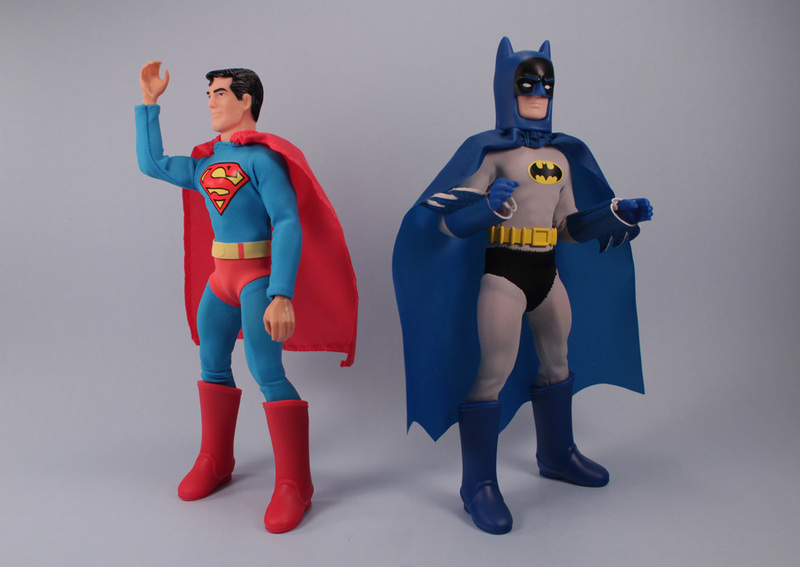 With wave one, five iconic figures are out the gates, and wave two coming with five more. They may be small, but the detail is appreciated. Just the metal chain alone on Panthro's nunchucks makes this set. This first wave is still pretty easy to obtain through Ebay, for a price thats very reasonable. I can't wait to set up some sort of mini adventure and I am working on my Thundercats impressions. Anyone do a good Tygra? I decided to add another Prime to my shelf, this time for Fall of Cybertron (sequel to that other game). 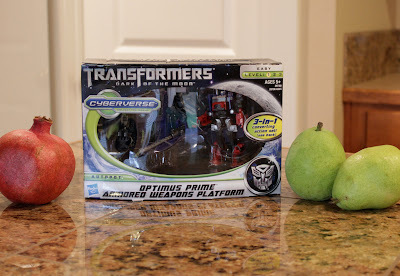 I was hesitant at first, as its getting pretty pricey for not as much Transformer these days, but I really like my assortment of Primes going on the old shelf. With that said, this Prime is rocketing up to one of my instant favorites. 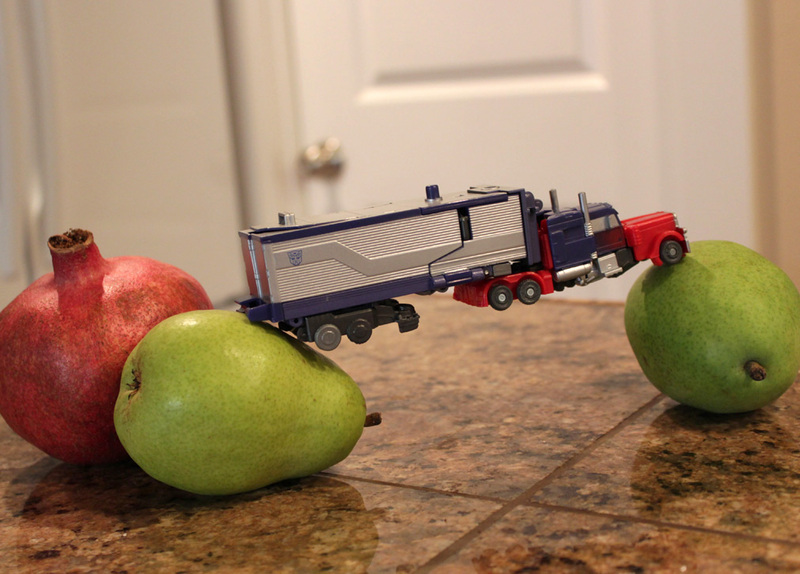 Mainly because he is very easy to transform. I didn't even need to consult the instructions, it was so simple. I like that that vs excusing yourself for 30 minutes of painful flap folding. Prime has good colors, proportions, and articulation. It is quite shocking to compare this Prime to the previous version, which I once compared to a lawnmower. 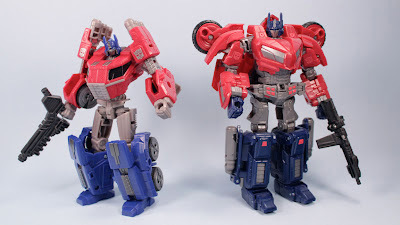 New Prime is much smaller and way less complicated than older Prime. 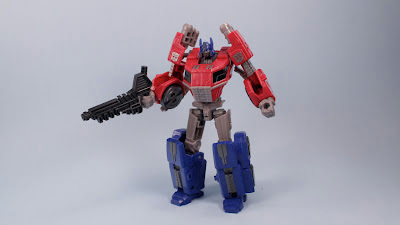 On one hand its bad that you have to pay more for such a simplified smaller Transformer, on the other, its an awesome fun simplified Transformer. The folks at Hasbro have really come along way these last couple years in making designs more cost effective, yet still fun. 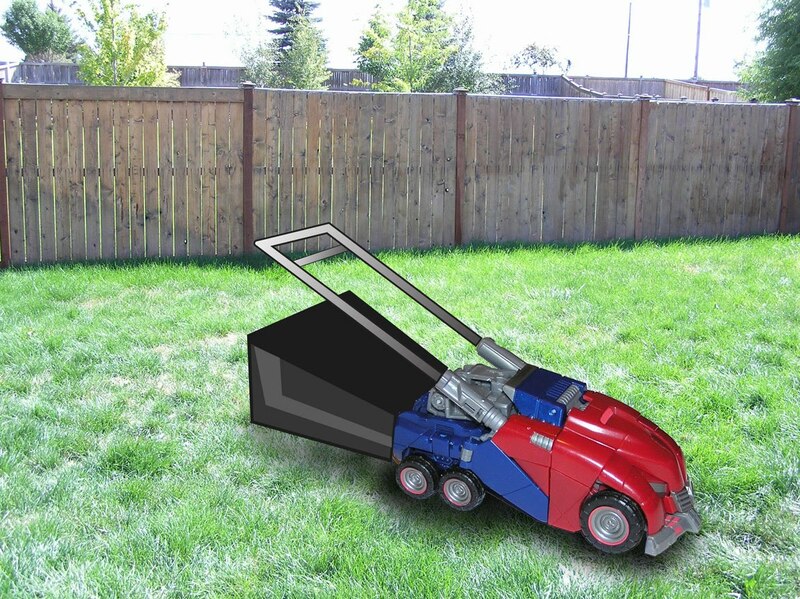 It was a nightmare, by the way, to get old Robot Prime back into Lawnmower prime. A ton of flaps and rotations, that I could barely remember from more than a year of non Transforming. 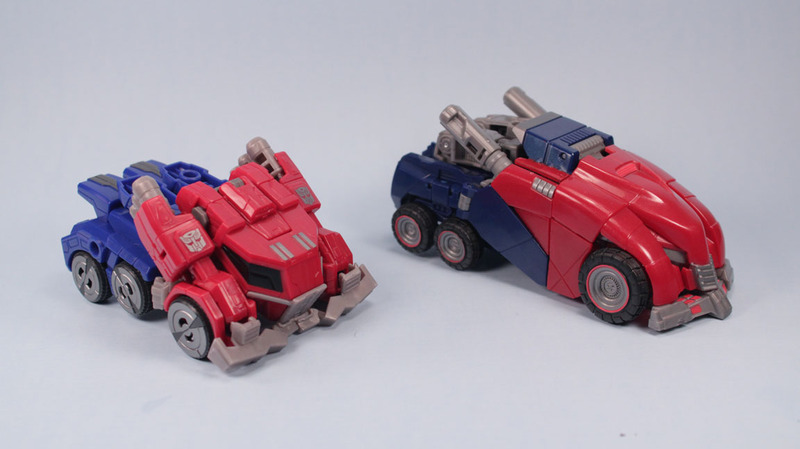 Yes, old looks cool on some angles, but it is too complex to transform cooly. If I need to pull a Prime down off the shelf to play, its either old G1 or this new one! I thought these two figures were kind of fun to pick up, as I am looking forward to seeing this new movie. I always enjoy watching Tim Burton's stuff. I hope there will be other toys that have a little more movement too.